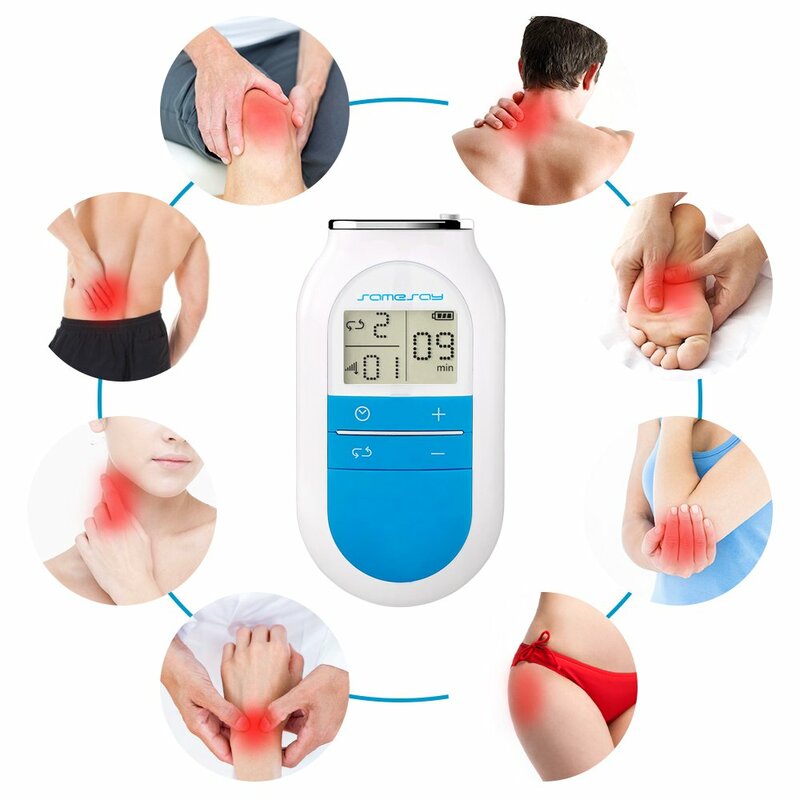 Samesay TENS Electronic Pulse Massager is a simple device for temporary relief of pain associated with sore and aching muscles in shoulder,backand so on, due to strain from exercise or normal household and work activities. The electrotherapy device is fully automatic, just click the buttons to change modes and intensity before its electrodes deliver effective stimulation for your body's soreness, stiffness, and aches. Whether you are just recovering from an injury or suffer from chronic pain, our TENS pulse massager offers instant alleviation and relief in a portable and convenient way. Are you feel tired? Do you suffer from muscle pain? After a workout or a long run in gym or long time sitting in the office, you're most likely going to feel some overall muscle soreness. So now you need a pain relief machine to solve those problem. Just try our Mini Low-Frequency Therapy Instrument with Multi Modes to relieve your body pain. 2. Do not use it near heart, over head, neck. The patches is made of non-woven material.These pads are certified latex-free and can be reused many times before replacing.Pls keep the surface of the electrode patches clean, or the viscidity of the pads will lower. When the surface get dirty, use water to clean and dry it before use to maintain sticky.Two storage plates are included to store the pads for later use. Designed with dual channels, you can use 2 or 4 pads at the same time to relief pain for your whole body. And the output of the two channels are the same. Thus you can share with friends or family for different strength needs. The connecting line is 1.2m. This muscle stimulator for pain management has 1 automatic compound massage mode and 4 different manual modes. Applicable to different needs of people. Wonderful combination of electrical pulses, allowing you to truly appreciate the acupuncture, scrapping, cupping massaging, hammering. People with back pain, arthritic or inflamed discs/ joints, shoulder tension and many more injuries and disabilities would benefit from the units relaxation and release of tension. Micro-computerized system,easy to operateis. Users can select appropriate treatment mode and other parameters through function buttons on the host and know about the current status through the animated display at any time. Large size and simple LCD screen makes it easier to read and operate clearly especially for the aged.The screen shows the massage mode, intensity and treatment time clearly. Our TENS unit has built in timer. It can be settled from 5,10 to 15 minutes. The instrument will automatically shut off when this time limit is surpassed.The setting can avoid overuse and you do not need to worry if you fall asleep when using it.